This is a shot I took just a day or two before thanksgiving (2010) . A friend and I went to the vista point over looking the bridge, hoping to catch some intense fog over the bridge but instead we got this view which I guess is much much better than what I was expecting. It was a full moon night, cloudy and winds were strong. On the top left corner you can see the blue color which is basically the moonlight and on the right orange-yellow color is the city light. 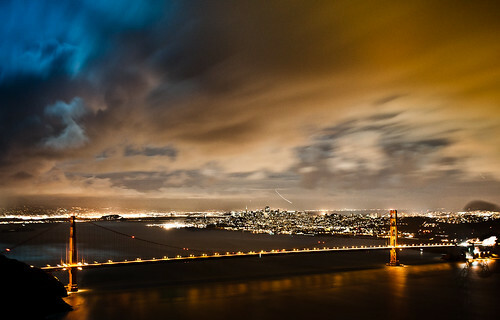 I wanted to capture more of the sky since there are many GGB photos.. and so I wanted this to be different…..